Be the first to share your favorite memory, photo or story of Bettye. This memorial page is dedicated for family, friends and future generations to celebrate the life of their loved one. 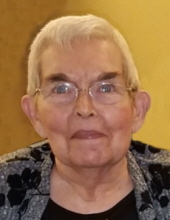 Bettye Pauline Meeks, age 81, formerly of West Manchester, passed away Monday, January 14, 2019 at the Greenbriar Nursing Center in Eaton. She was born January 21, 1937 in Carroll, OH to the late Charles L. and Mary E. (Miller) Schlotterbeck. Bettye was a 1955 graduate of Monroe High School and graduated from Miami University with a Bachelor’s of Science Degree. She taught school at Monroe for several years, retiring in 1997; and was a member of Wares Chapel United Methodist Church in West Manchester. In addition to her parents, she was also preceded in death by her husband Earle W. Meeks, who passed away December 10, 2018; and foster brother Harley Hanna. She is survived by her daughter and son-in-law Marye and Steve Heitzman of Eaton; grandchildren: Ryan (Renee) Heitzman of Dayton and Angela (Ryan) Chalfant of Richmond; great grandchildren: Emily, Alexa and Hayden; sister Charlene Driver of Eldorado; brothers Stephen Schlotterbeck of Okeechobee, FL, Richard Schlotterbeck of Lewisburg and Lynn Schlotterbeck of Palmyra, MO; foster brother John Hennemyre of Laura, OH; brother-in-law Darrell (Pam) Meeks of Eaton; sisters-in-law Jean Meeks of Eaton and Connie Meeks of North Carolina; and numerous nieces and nephews. Visitation will be held on Thursday, January 17, 2019 from 5:00 to 7:00 pm at the Girton Schmidt & Boucher Gard Funeral Home, 226 West Main Street, Eaton. Funeral service will be held at 11:00 am on Friday, January 18, 2019 at Wares Chapel United Methodist Church, 1060 Foos Road, West Manchester, with Pastor Laura Thomas officiating. Burial will follow at Wares Chapel Cemetery. Memorial contributions may be sent to the church. Online condolences and other remembrances may be sent to the family by visiting www.gsbfuneralhome.com. To send flowers or a remembrance gift to the family of Bettye Pauline Meeks, please visit our Tribute Store. "Email Address" would like to share the life celebration of Bettye Pauline Meeks. Click on the "link" to go to share a favorite memory or leave a condolence message for the family.